Decorating for Easter does not mean you have to craft up serious and fancy DIY Easter egg ideas or other décor ideas. 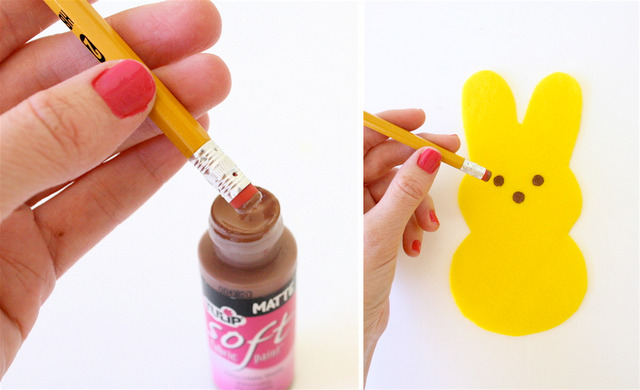 Have some fun with Easter craft ideas when you learn how to make these Peeps-inspired pieces of décor. 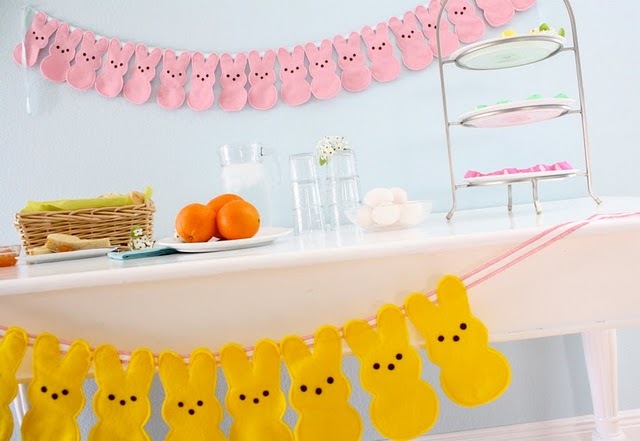 This DIY bunting tutorial is perfect for brunches and Easter egg hunts, because it is both extra cute and out of the way. 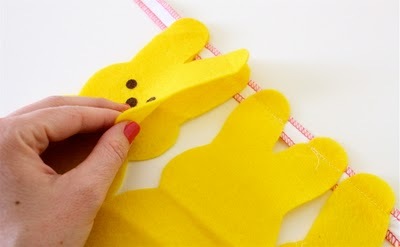 The Bunny Peeps Bunting are made out of pastel felts and require a basic knowledge of a sewing machine. 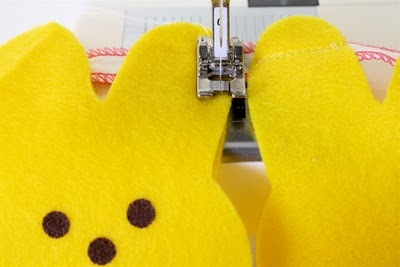 If you do not have a machine, you could easily hand sew the bunnies or even use a hot glue gun. Looking for even more Easter craft ideas? Head on over to our full collection of Easter craft ideas for Easter egg designs, DIY bunnies, Peeps-inspired crafts, and even more homemade cuties. First, cut out your pattern. Click on pattern to open pattern in new window. Then "save as" to you computer. Open it in a Word doc and insert the picture so you can adjust the size for your needs. If you don't have a printer, just put a piece of paper up to your computer screen and trace the image right on top! You can also grab the pdf pattern here. Sewing the backs on first makes the bunting a bit stronger, the bunnies are likely to be straighter, and it's more polished looking. 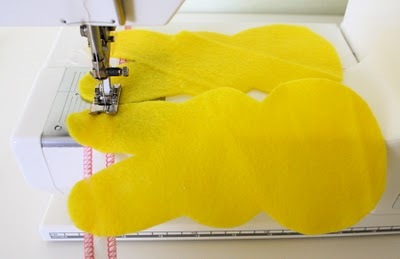 After sewing the back bunnies on by their ears, you sew the front bunnies on top, sewing an outline around each one. Here's where I laid the front bunnies on top of the back bunnies and sewed all the way around each one. Repeat this step till all your bunnies are on! Find even more gorgeous Easter craft ideas in our eBook12 Easter Egg Ideas & Easter Crafts for Adults. 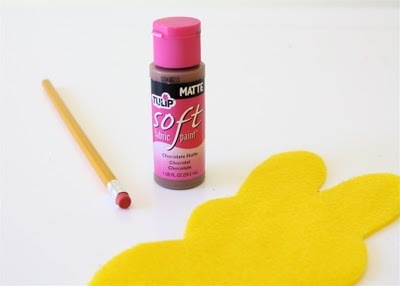 These DIY crafts are all designed especially for grown-ups, offering you stunning ways to decorate for spring's favorite holiday. Wow, these are so dang cute! 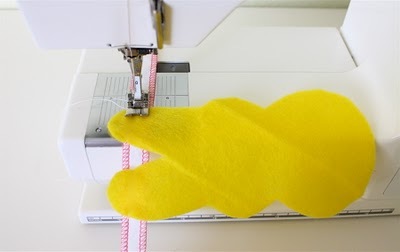 I don't have a sewing machine, and even if I did I would not be able to remember how to use it- it has been decades. However, they can easily be put together with a hot glue gun. I think I'd even fill them with fiber fill just a tad, to add dimension.ADORBS! 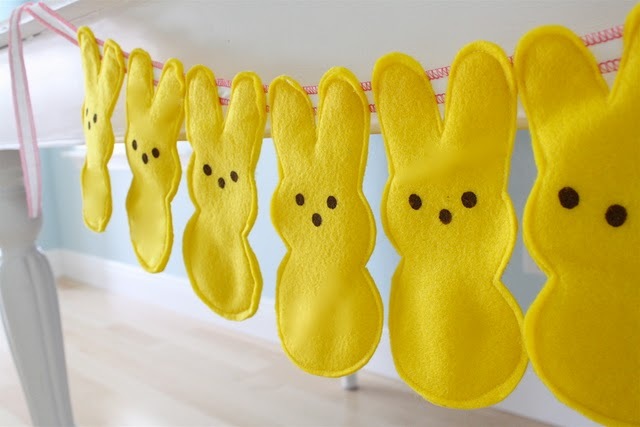 This Easter bunny peeps bunting to just too adorable. 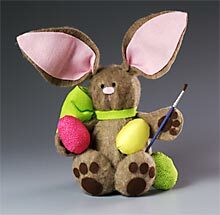 Considering making this bunny but not as a bunting but as a pillow, something like a little toy to place in the basket. Thanks for the inspiration. 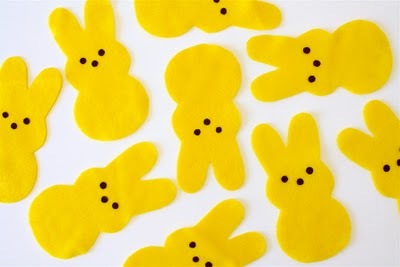 My favorite Easter candy is the yellow chick peeps but these bunny cutouts are to die for. They look so professional. Sewing the two pieces together really provided a finished look. Thank you for giving all the details in the instructions. Next time, maybe paint the faces in the end? How cute is this? I love this idea. 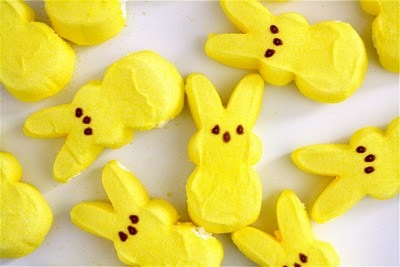 Peeps are my favorite Easter candy. 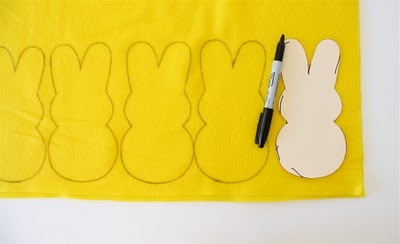 I found a similar idea for the little chick peeps banner by searching for "chicken peeps outline" on Google and Bing. 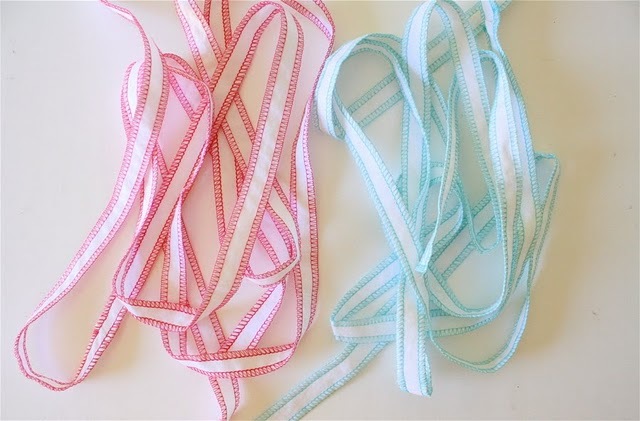 That should give you the pattern to create the peep banner. Happy Easter crafting. I have been doing something quite similar for years only it is with ginger colored felt and the shape is gingerbread men and women. I make the form and then dress the female with hair and a ballerina skirt and top for Xmas or Pilgrim outfit for thanksgiving and the boy in white shirt red tie and black pants for Xmas with a red cumberbun and a pilgrim suit for Thanksgiving. I also make a snowman the same way and give it a piece of toothpick dyed orange for a nose, felt buttons, black beads for mouth, sequins and beads for eyes, a scarfe made from ribbon and I make a top hat for the head. All have a ring of ribbon the comes out of the top of the head. To make the top hat is 2 rings about 1/4 of an inch, a 1/2 inch tube in height, then cut slits in one end about 1/16 of an inch deep. Stick tube in the center of 1 ring and glue bent slits to under side then glue other ring onto the glued slits. Now cut a disc a little larger than the tube and cut slits aroung the parimiter to the size of the tube. Bend the slit flaps, put glue on top of them and slide the flaps down inside the tube. Press flaps against inside of tube to secure and now you should have a hat. Super cute!! Now, why didn't I think of this? Great instructions. These are the gosh darn cutest things I have ever seen!!! I have to make a few of these to send to my youngest daughter in South Korea who is, at this moment, having a Peep's craving! I can send these and know that they'll arrive in fine shape, whereas sending the real thing will arrive stale and hard as a rock! Thank you for sharing such a cute project. So sweet! Love it! And one of my favorite treats too! Thanks for sharing.